So how was your Thanksgiving? Even though I wasn’t the host this year, I sure cooked and baked like I was. A great time was had by all. 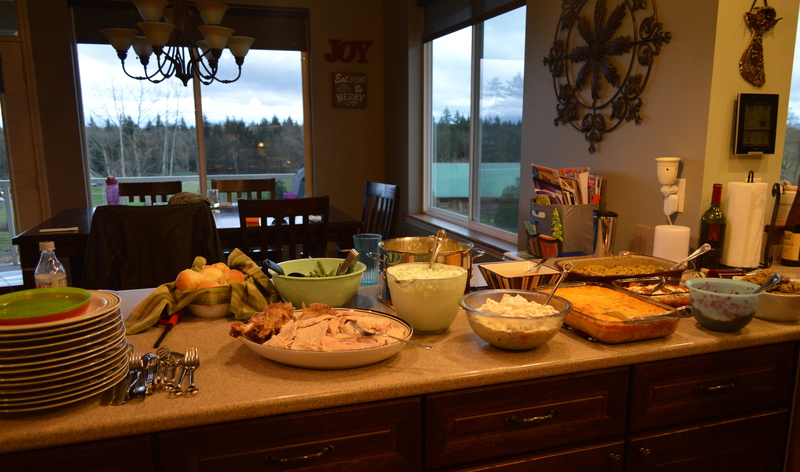 Look at all of this food and that’s not even the desserts or the appetizers and snacks we had earlier in the day. My contribution was Artichoke and Crab Dip with cute little shaped crostini for an appetizer. Unfortunately I forgot to take a picture and they went fast. I also made my first batch of fudge for the season and some Scotchy Peanut Butter Bars. These two things start my Christmas season off with a bang. For the main dinner I made homemade dinner rolls. My sister-in-law thought they were store bought. I thought they tasted almost as good as Texas Roadhouse dinner rolls. 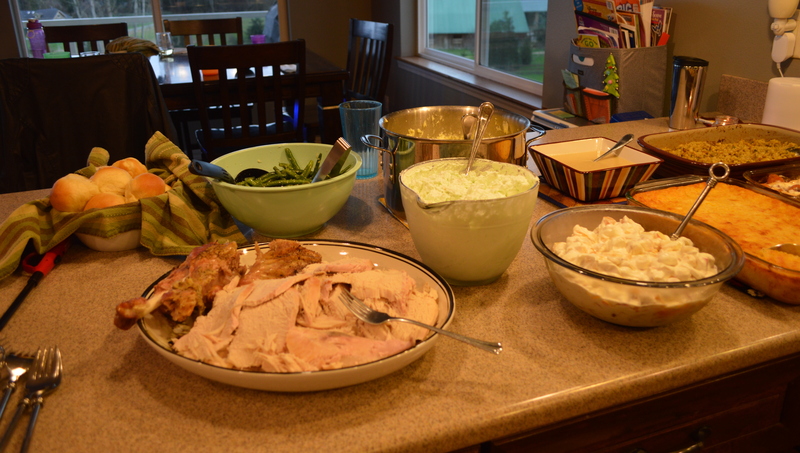 I also made the stuffing for the bird. I made it the day before and gave it to my sister-in-law so she could stuff the bird. Usually we make do with it baked in a casserole dish, but I don’t care what anyone says, it just doesn’t taste the same. Some like it cooked in the bird and some don’t. I usually make so much we can easily have both. I also tried making this Cornbread Dressing for my SIL because it is what she grew up with and she was nice enough to cook the turkey with stuffing this year. I think I have to work on the cornbread dressing though. It wasn’t quite right in my opinion. The spices weren’t quite where they needed to be and I thought it was a bit dry. I like a more wet dressing. I also made a three berry cranberry sauce. It was perfect this year. Not overwhelming allspice or orange, not too sweet and yet not too tart. I think I may finally have that recipe down. 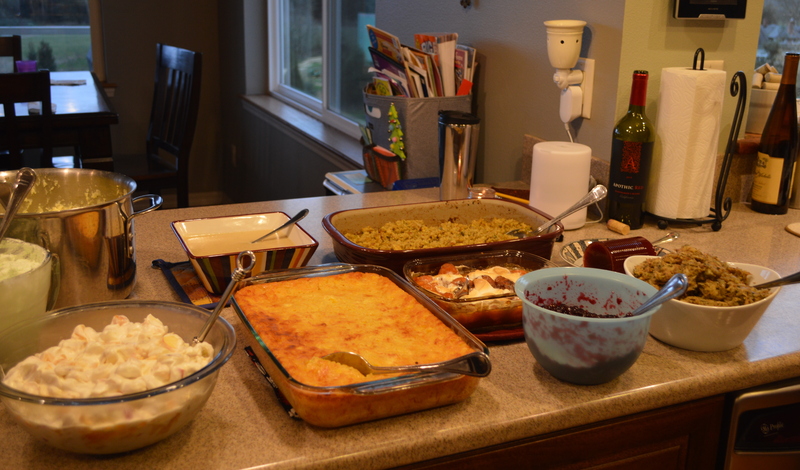 I also made the gravy and some candied sweet potatoes. Yes, there is a can of jellied cranberry sauce sitting there too. Half of the family will only eat the cranberry sauce from the can, they don’t like my whole cranberry sauce. I tried a little of everything and couldn’t eat it all. I had a hard time eating dessert three or four hours later, I was still so full. I hope everyone had a great holiday and you didn’t stress too much. For once I was rather chill and ready on time. For me that is quite a feat. Now to get ready for a couple of days worth of holiday baking. Already have the shopping done for that.